This show will be the stadium show for the DVD! As we arrived at the rugby ground, there were posters saying this show would be recorded, and there were cameras all over, just like in Amsterdam last week. Mick's voice was absolutely fantastic. During Wild Horses he pulled that little extra, you could hear he was fully recovered, and he had power from start to the very finish. The sound at the stadium was outstanding. Crystal clear where I was on the pitch. And it was strange to have a chair on the pitch, juts like they have in USA. I can't remember I ever had a chair on the pitch in Europe, at any shows. Mick had great fun, Ronnie seemed very concentrated, not any fooling around, Charlie was sporting the very same orange t-shirt he had in Amsterdam, keeping the beat steady and hard, and Keith was mastering the floor, such great playing I could not believe it. Brown Sugar - did he ever start it wrong? Well for this show past versions were history. When BS started it was so clear and sharp you could feel it cutting through the air all the way down to central London. Same with Honky Tonk Women, or Start Me Up, or any others of the big-riff power startup songs. Keith nailed them and the stadium rocked. I missed the Wembley crowd, and I realize it will never be back. The walls of Wembley are down, so we won't have those great crowd acoustics. But the band acoustics were better tonight, so anybody that could not go tonight - you have another chance next month for the delayed show. Never heard such great acoustics! The special Stones rugby t-shirt sold out long time before the show started. Those who picked it up got a great souvenir. But I am sure they will print more for the delayed show. As they left, Mick said: "See you on Wednesday"! The Rolling Stones are back home and I'm really happy to be around London this week. First of all, I also had a sore throat when I went to Amsterdam last week and now I'm suffering from a cold. Luckely, I don't have to sit before the fences for hours and although I didn't liked the idea of reserved tickets, this was great for me because I didn't had the energy to wait. Much to my surprize I sat with some friends in block 105 and we had a splendid view over the stage and stadium. I've been to club shows as well as arena shows and I thought this was going to be one of my last stadium shows... I like stadiums but the setlists are quite similar but Twickenham was special. The sound was perfect with great acoustics. For all those who missed this show, come over to our boy's homeground next month, you won't regret this. Mick's voice was fantastic and Charlie hit the drums really hard during Paint It Black. I haven't seen Ronnie drink any coffee but he didn't fool around that much and Keith stole the show when he started with his songs. I think that he really enjoyed staying again in Britain and seeing his home in the Witterings. And I hate people who went for a drink or toilet during Happy... they will definitely NOT buy the DVD of the show. I'm still impressed by the stage itself when you're not in front of the stage but a little bit further. Mark Fisher did a good job and it's really amazing to see all effects during Sympathy and the fireworks during Jumping Jack Flash. After the show, we walked back to the Underground and I feel very sorry for those zho left the show earlier and I can ensure you, many persons were even leaving during Start Me Up... one thing is for sure, The Rolling Stones started me up and I'm feeling much better then yesterday. Last night's homecoming concert at Twickenham Stadium was excellent. Much better than their show when I saw them in Boston last year. The band were on great form and the crowd crackled with energy. A great set, including a few less-frequent tracks like I Just Want to Make Love to You, Paint It Black and Star Star made for a pleasing change. Don't Stop went down a storm - a new definite new crowd favourite. You Can't Always Get What You Want was great as usual and Start Me Up really rocked. I haven't got tix for the Astoria show but am hoping to catch them again at Wembley Arena this Friday. (Mick Taylor's on the night before at the 100 Club too). Wow. That's all I can say. How can I ever listen to the records again, they won't have the same magic as last nights show. 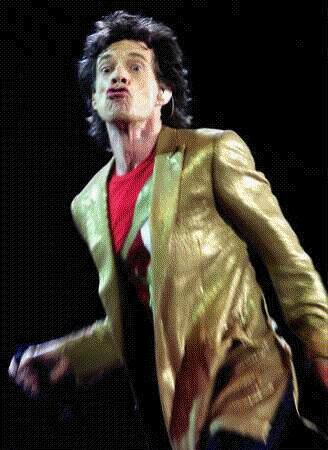 I have waited a long time to see the Stones live and if you have not yet seen them then sell your grandmother, sell you body parts just go : you will not regret it! I didn't watch the whole of Starsailor, the sun was too pleasant. I stood on a balcony watching the sky and witnessed concord taking off, a spectacular site and an enormous sound; but sill no match for what I was about to see and Keith's guitar was louder too! The sound was amazing, the driving rhythm of every song, the combination of those instruments actually embarrasses those magic records I have listened too for all those years, its hard to explain how they were so much more last night but they just were. In the papers you will read how they are too old and they do it for the money etc, well not last nigh - oh no. Mick looked and sounded mighty fine for a someone recovering from flu and if they are too old how come they never stopped moving? I have seen lots of bands who claim to be the 'new rolling stones' who half or even a third of these guys ages and these bands have hardly moved a muscle all night. It was so obvious that they are not in it for the money, they love it. 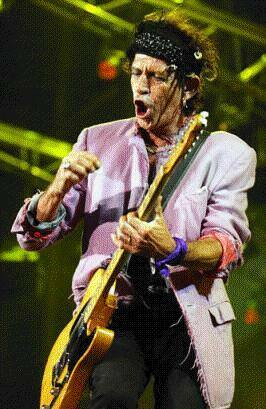 Keith especially seem quite overwhelmed and emotional, especially after singing Slipping Away. I had my finger crossed that Keith would do Happy, a personal favourite and it sounded so good live. Thank you Keith. The second stage is great, I wish they had played there all night, especially as they were playing some fantastic sounds there. I think that Keith shook everyone's hand on the way there and back too, what a gent. To sum it all up, the music was spot on, Micks singing was spot on, a stadium singing Cant Always Get What You Want was magical and Gimme Shelter was truly awesome. Thanks Guys! Very disappointed that �55 ( & the rest on top ) bought us seats literally in the rafters at the the very back of the middle tier. When the Stones came on, we couldn't see the screens, because of the sloping roof ( holding the tier above us). For an unobstructed view of the screens, We had to kneel on the floor! When everyone stood up, it meant our view was non-existent if we stood up! The irony - having to sit through a Stones gig!! What was even more galling was the large blocks of empty seats - what was that all about? The sound seemed to come & go, as though being caught in a wind, though I suspect we were losing a lot because of the structure of the stand 'absorbing' it. It was also difficult to understand all of what Jagger said. The set list was all I could have wished for - fantastic. The band were on top form. We were grateful for the 3 song mini-set on the B stage. We went down into the aisle for the last 30 minutes of the show ( before that the stewards had been telling people to get back in their seats ), & everything was transformed - the view obviously, but the sound too. Thank God we experienced that last bit, otherwise we'd have been seriously disappointed at the whole gig. Anyway, great day out, on the whole a good venue, but someone should look again at those top seats! What a great day out. I went with two people who had never seen the Stones live and yes they got their Rocks Off! We sent the afternoon in the Cabbage Patch drinking in the atmosphere and a few beers... so much so that we were ready to enjoy a great rock 'n' roll show. We had great seats in the ground on the pitch next to the B- Stage on Ronnie's side. (would have preferred Keith's side) but hey beggars can't be choosers. Starsailor, the support act were good but not brilliant. They seemed a little in awe of actually opening for the Stones and I think their nervousness showed a bit. They weren't able to get the crowd going unlike previous Stones supports that I have seen such as Sheryl Crow or the Black Crowes. On with the show..... blistering opening with Brown Sugar which showed they were really up for it, You Got Me Rocking was well just rocking.... I am now really enjoying the show, hairs on the back of my neck up on end. Don't Stop was good to hear live and then disaster strikes with Rocks Off, a shambles from beginning to end. It sounded as though Mick was following the Horn Section who were about a beat in the bar too early ( maybe an on stage monitoring problem). You could clearly see that Mick was annoyed. Then miraculously they brought it back from the edge of the precipice with a surprise Paint It Black. 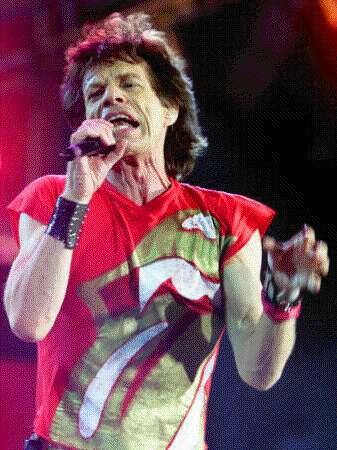 Then it fell apart again on Tumbling Dice with Mick singing faster than the song! After the band introductions Keith brought it back from the brink with his solo numbers...absolutely brilliant, Sympathy just burning, literally, the B- Stage was amazing esp with Street Fighting Man and it just got better and better. JJF as the encore just rocked with some excellent jamming at the end and then they were gone. Roll on Friday. I was at the Twickenham gig for my 50th Birthday, but I am surprised at the great comments. As usual, The Stones were fantastic but I had to sing along out of memory as Micks micrphone did not carry to our part of the stadium, the bass came over as drowning everything out and at some points it was difficult to even recognise some numbers until part way through the song. Usually the opening bars get you ready for whats coming but at Twickers it just got us guessing, like ''name that tune'', Mick and the boys were great though, cant wait to see them again, thanks lads. (not Twickers though).